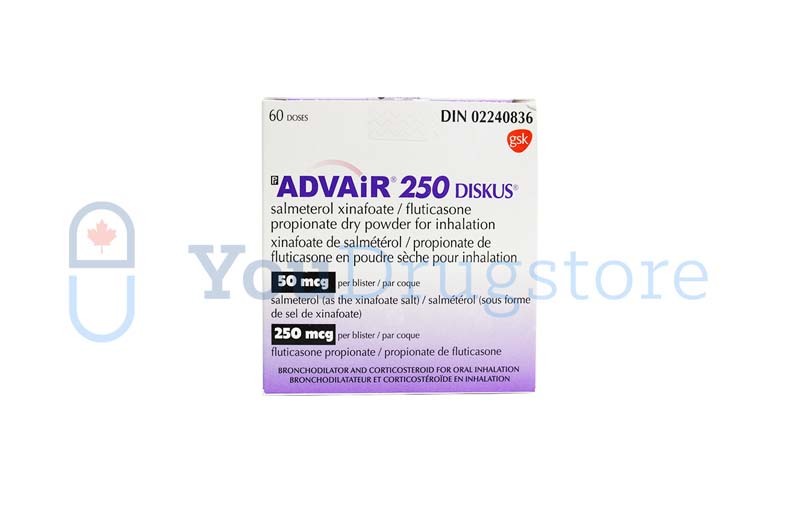 Who can purchase prescription Advair Diskus 250/50 mcg? If you have an Advair Diskus prescription from your doctor, you can fill your prescription at YouDrugstore, an online Canadian pharmacy. The YouDrugstore health care staff will review your prescription then ship the medication directly to your mailbox for a low shipping price. Order the inhaler from YouDrugstore and find out why so many people buy drugs from a Canadian pharmacy. Why do doctors prescribe this inhaler? 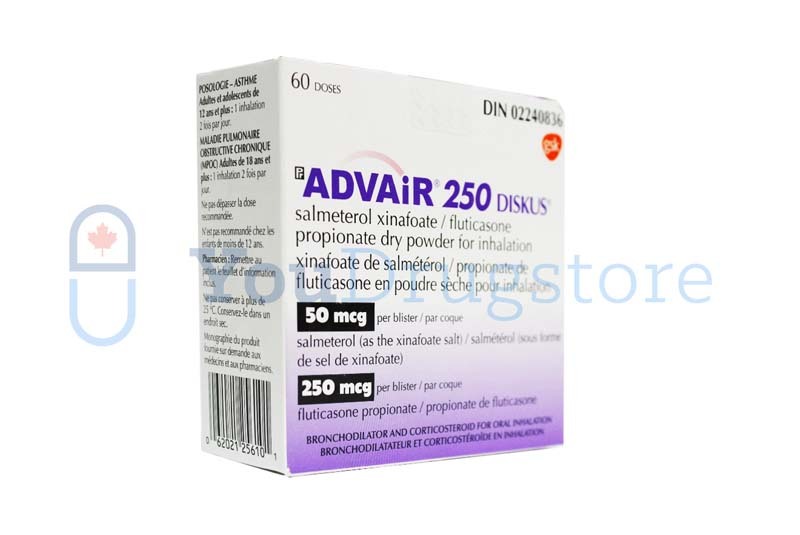 Doctors usually prescribe Advair Diskus to asthma patients over the age of four in addition to their fast-acting inhaler. This inhaled powder medication can help asthma patients manage their asthma symptoms and improve their breathing. Doctors may also write a prescription to patients suffering from chronic obstructive pulmonary disease (COPD) that is associated with chronic bronchitis or emphysema. The medication can help prevent asthma and COPD symptoms such as shortness of breath and wheezing. Advair is a daily preventative medication and does not replace a fast-acting inhaler. The powder in the Advair contains two active ingredients that can help asthma and COPD patients manage their symptoms. The first ingredient in this medication, fluticasone propionate, is a corticosteroid. Fluticasone helps reduce inflammation, irritation, and swelling in the patient's airways, which opens the airways and allows the patient to breathe easier. The second ingredient in the medication, salmeterol xinafoate, is a long-acting beta agonist that helps open airways in the lungs. Together, the ingredients in Advair Diskus help patients breathe easier with less wheezing and shortness of breath. an upper respiratory tract infection or viral infection. The risk of developing thrush can be reduced by swishing and gargling water after taking your inhaler medication. changes in the levels of white blood cells, potassium, and sugar in the blood. These may not be all the possible side effects of this medication so be sure to speak to your health care provider if you have any concerns or experience any unusual side effects. You should not use this inhaler to replace a fast-acting inhaler. Take one inhalation of Advair twice a day, about twelve hours apart, to help manage your COPD and asthma symptoms. After you inhale it according to your doctor's directions, rinse your mouth and throat with water to help prevent thrush from developing.